This pink and pretty Lydia crocheted baby blanket is guaranteed to put your baby into a super comfy sleep. Its light and airy design makes it the perfect choice on hot summer days. In fact, this pattern is ideal for people with intermediate crochet skills. 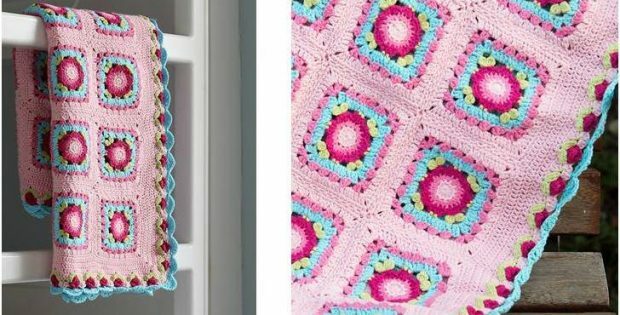 They’ll definitely enjoy making this multicolor crochet baby blanket. Once finished, the crocheted baby blanket should be approximately 37 inches by 28 inches in size. In metric measurements, the completed baby blanket should be around 95 cm by 72 cm. This pattern is another wonderful design by passionate crochet crafter Dedri Uys from Look At What I Made. In fact, you can access the FREE pattern for this lovely crocheted baby blanket from her website. To access the FREE pattern for this beautifully crafted baby blanket, please click on this link: Crochet Lydia Blanket Pattern. Featured image: Dedri Uys/Look At What I Made – thank you!